By combining intelligent sample preparation with latest next generation sequencing methods, we analyse transcriptomes, genomes and epigenomes at highest resolution. Our service comprises project planning, consulting, sample preparation, sequencing and bioinformatics. 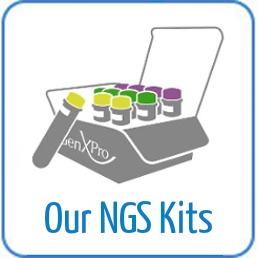 Thanks to many years of experience with deep sequencing, we have accumulated vast knowledge in low-bias sample preparation of all kinds of different biological samples and provide appropriate solutions for all areas of life science. Thanks to our “TrueQuant” Method, we can identfy and eliminat PCR bias and provide qualtiative and quantititve more accurate data. We apply all sequencing platforms for a maximum of flexibility and also combine them („Hybrid-Sequencig“), e.g. PacBio and Illumuna. Our team of bioinformaticians applies most advanced methods and designs individual solutions to handle the data on our powerful CPU clusters. Data is delivered in ready-to-use format and includes quality information, quantification, annotation, mapping, Gene Ontology analysis, plots and other graphics.